Microsoft unveiled its Universal Foldable Keyboard — a $100 robust and portable mobile accessory — at Mobile World Congress 2015. The Bluetooth clamshell keyboard can be used with Android, iOS and Windows devices, and charges via USB. It's an interesting, platform-independent add-on that's a reminder of Microsoft's evolution as a hardware maker. The company's Web site and dedicated bricks-and-mortar stores are filled with Microsoft-branded gadgets for the living room and the boardroom. 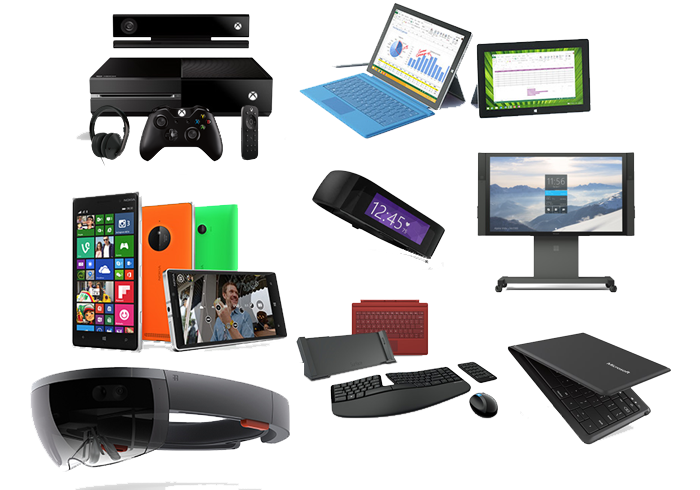 Microsoft's broad family of products includes market-leading and category-defining wearables. Its HoloLens augmented reality product is arguably one of the most innovative hardware products on the market, and the company's tools to create social games for the head-worn device could help it to morph into the console of the future. Microsoft's position as a hardware innovator has gone relatively unnoticed, lost in crowd of software and services announcements as well as several high-profile failures. Its short-lived Kin and Zune lines of portable devices have become industry metaphors for too-little-too-late me-too gadgets, and tended to overshadow the innovative successes on the other side of the equation. The sensor-filled Kinect, for example, was one of the most ground-breaking products of its day and continues to define the category. If the smartphone or laptop or game console of future generations looks more a HoloLens than a Lumia, then Microsoft is in great shape. However, the company tends to create excitement about the industry's own possibilities, leaving some observers with the impression that its cutting-edge products might be little more than in-house science projects. Microsoft's hardware portfolio deserves a lot more respect than it gets. Credit is a valuable and often misplaced commodity, but Microsoft has come a long way from selling simple mice and keyboards. The company has evolved as software, services and gadgets have become inseparable. Its early recognition of the importance of consumer cloud services (after all, it bought Hotmail back in 1997) shows that the company is often ahead of the curve. Hardware is no longer a side dish for Microsoft, but clearly an integral part of the company's development. This isn't a hobby.